The needs of welders dictate the type of suitable extraction systems. This depends on various factors, such as the local conditions. 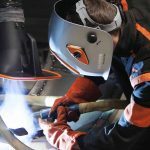 Metalworkers basically have the choice between mobile and stationary devices or central systems for extracting welding fumes. 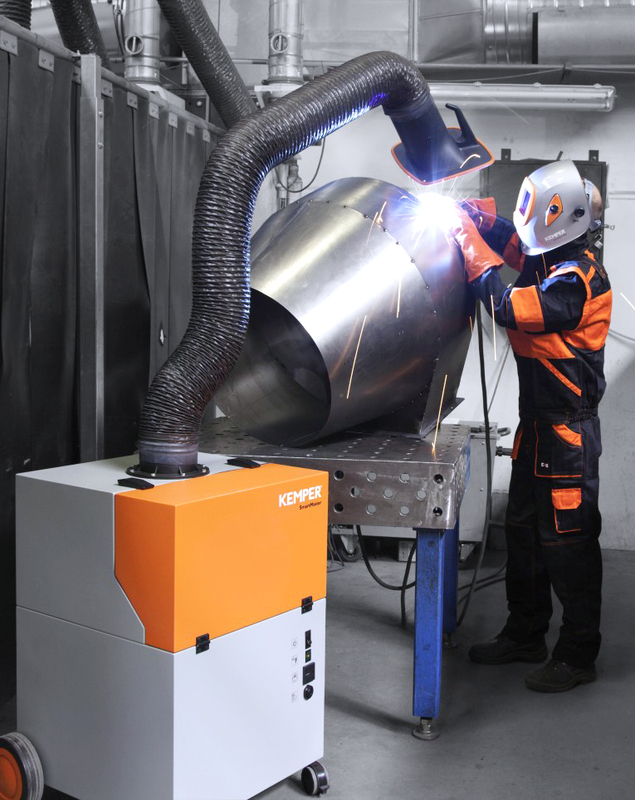 When purchasing new extraction and filtration systems for welding fumes, the question of the type of suitable system quickly comes to the fore. Several factors have an effect on this decision. Metalworkers have to face a number of questions, including: What options do my production facilities offer for extraction and filter technology? Which workpieces do I generally work with? Do I want an exhaust air solution? Essentially, metalworkers have the choice between mobile and stationary extraction systems or central extraction systems when it comes to extraction and filter technology. Mobile extraction and filtering devices are moved manually by welders and can therefore be used in different places. But the main focus for the use of mobile extraction devices should be on the on-site conditions. High movement radius is needed for mobile devices Unlike stationary mounted extraction devices, mobile devices have a greater range of movement, but they can also block the space necessary for important welding work – or the space for the free-standing appliances is not available anyway. Thanks to their mobility, the mobile devices can be situated closer to the workpieces when welding, however. This means that only shorter extraction arms are needed. In order not to jeopardize the stability of the devices, mobile extraction devices and filter devices are up to four metres long. Mobile devices are the first choice when changing workstations or when the workpieces are extremely large and a change in the welding position is required. Stationary systems can be integrated into solid welding stations, however. They are required when space-saving solutions are important. 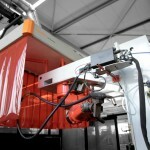 Thanks to its permanent installation, it is also possible to use up to ten-metre long extraction arms during welding. 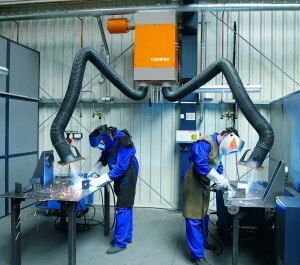 This allows maximum flexibility at these welding stations. Stationary extraction devices are the first choice if the extracted air should not remain in the production hall at all and be vented to the outside. It only makes sense to connect this device to a fixed pipe system for exhaust air. Mobile devices would lose their mobility otherwise. Parallel extraction of multiple workstations with centralised extraction systems Central extraction systems for welding fumes are especially required when extraction is needed at several workstations simultaneously. 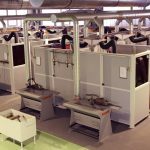 While there are also mobile and stationary devices that can ventilate several welding stations simultaneously, however, the number of extraction arms is limited to two. If it is important to remove welding fumes from numerous fixed workstation, it is generally not worthwhile using single devices, but rather a central extraction system to provide effective OSH. 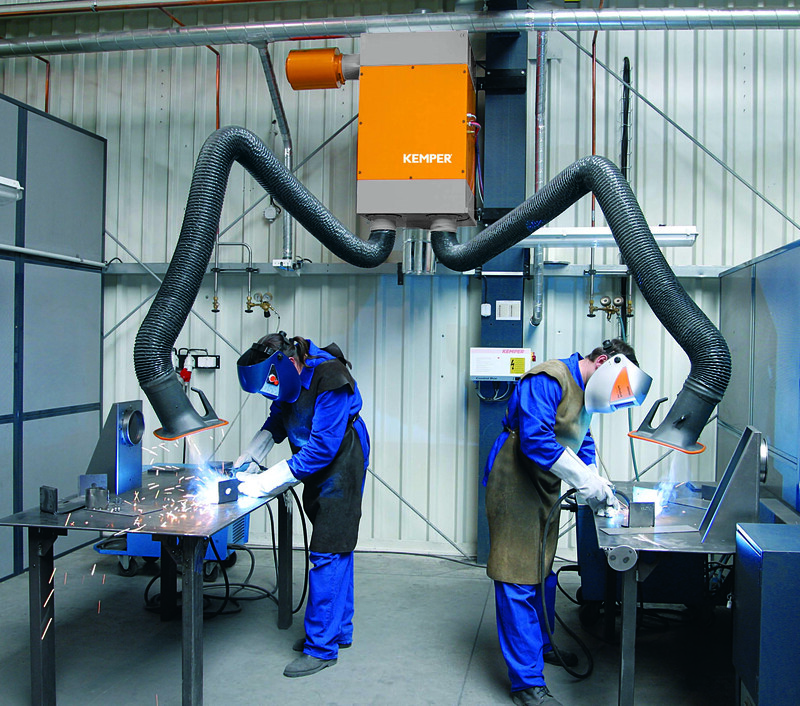 These exhaust systems are connected via a pipe system with the extraction arms to the welding stations. They provide the necessary air flow rates and have larger filter elements. In order to continue to save space, this central extraction and filtration equipment for welding fumes is also available in weather-proof design for outdoor installation.